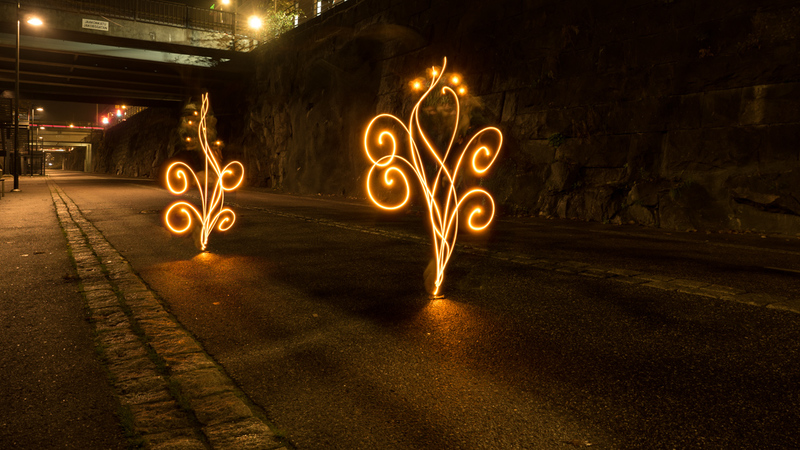 And the winner for the Flower Light Painting Photography Contest is…. Stephane Babatasi and Mass Light for their collaborative creation above! 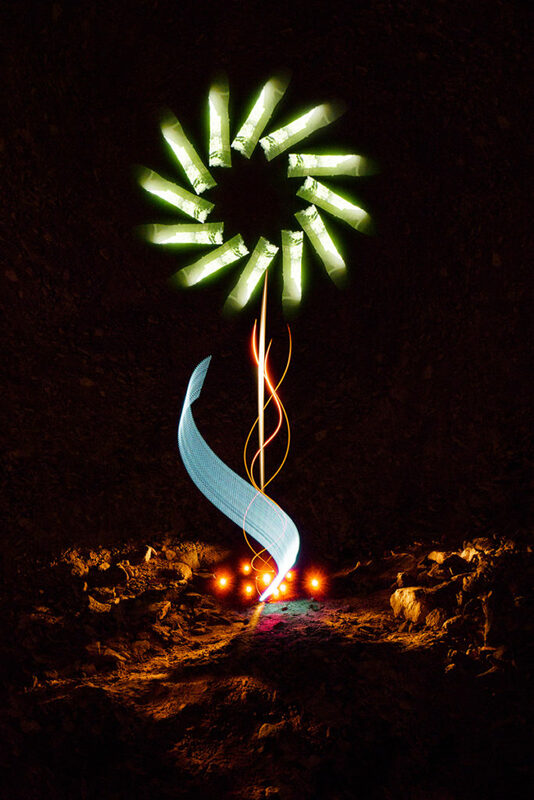 This awesome light painted flower was created during a LFLP Meet-up in Provence. Mass created the Calligraphy after Stephane made the dialed camera rotation of the quarry entrance and illuminated the ground. For this winning image Fran will receive a pize package filled with illuminating tools from our sponsors below. For your chance to win click here to see the next Light Painting Contest Theme and how to enter. 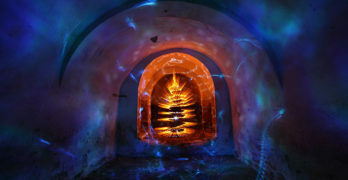 The winner for the light painting Light Blading contest is Francisco J. Lojo Pasín for the smooth spinning image above! Fran said this about the winning image! I used two flashlights with different power, the one with less power was attached to the homemade rectangle plexiglass and the other to a little acrylic bubble tube, both of them in strobe mode! The process of taking the pic was easy. I held the two flashlights with a hand and while the camara is spinning I shot with a remote trigger and move the lightblades up moving my wrist to finally point the flashlights to the white roof and cut the exposure. I tried with many different colors, motions, positions… but finally I decided not use colors and played only with the white balance of the camera. 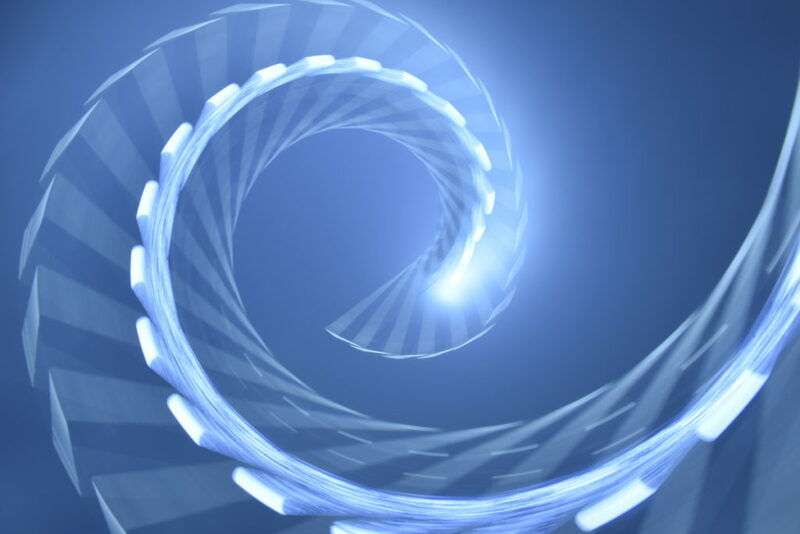 for this shot it was the ‘incandescente’ mode combined with white background ( the roof ) and different power of the cold flashlights, made a great blue tones image, it’s a stunning spiral effect! I’m very proud of the results! My gear: Nikon D5300 with the 18-140mm kit lens. 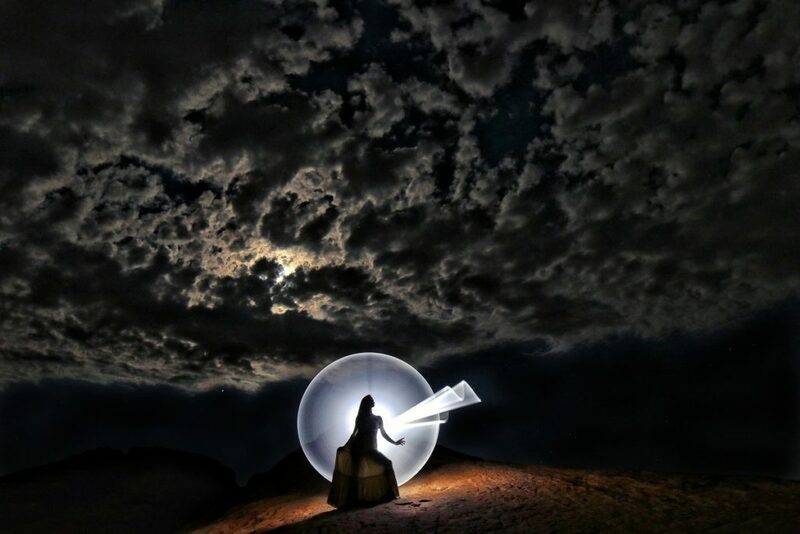 Check out more of Fran’s Light Painting work on his Flickr, 500Px, and Instagram! As a special addition to this contest prize package Patrick Rochon donated his entire new KYO LITEBLADE SYSTEM! The kit will include, a Klarus XT11S (1100 Lumens), 7 round bottom Liteblades, 1 KYO attachement, one remote pressure switch and a colour sample pack! And the winner for the Fiber Optic Light Painting Contest is Kim Von Coels for the awesome image above! Kim said” I created this image with the help of my friend Domenic and the lovely Maddy in an experimental session in my spare room. The Gear Used: Nikon D610, basic tripod and a Nikon nikkor 24-85mm zoom lens 1:2. You can check out more of Kim’s amazing light painting work on her Instagram page here and Her Website here! 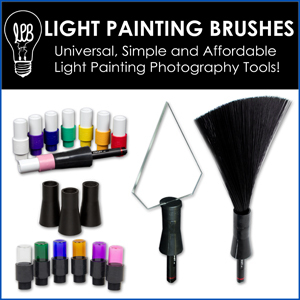 For this winning image Kim will receive a pize package filled with illuminating tools from our sponsors below. For your chance to win click here to see the next Light Painting Contest Theme and how to enter. And the winner for the Eric Paré and Kim Henry style TUBE Light Painting Contest is Brian Rodriguez for this simply beautiful image that he created in the Valley of Fire just outside of Las Vegas, Nevada! 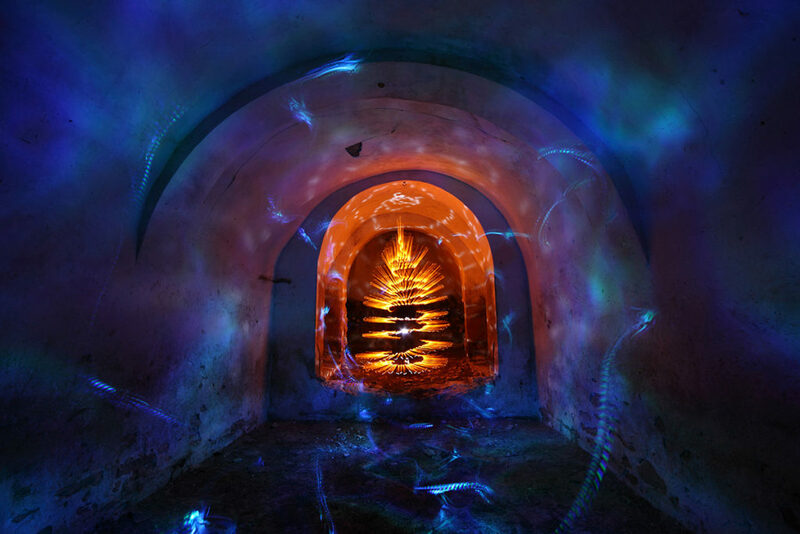 Here is how Brian created his winning light painting! “So for this shoot, the model and I drove 1 hour outside of Las Vegas to Valley of Fire. It was our first time working together and I had plenty of time during the drive to let her know what we wete going for. Despite getting there after sunset (women and their makeup/hairdos) and exploring in the dark while having bats fly in and out of our nearby view, we found a promising spot that combined the moon. Our first angle was not the one you see in the picture, it was more from a sideways view. The exposure didn’t take many tries to achieve correctly, the challenge was the fact that we were on an incline (at this time we also had clear skies). I kept coming out accidentally in some pictures, or my model kept losing balance one way or another due to the slope of the hill. Not only that, but I had to squat down behind her as I raised my arm high enough due the light circle which, I learned, is quite challenging and uncomfortable also due to the slope. As the night progressed, we changed angles to the one you see from my entry. 600 lumens zoomable flashlight inside a T12 tube with parchment paper. Check out more of Brian’s beautiful light painting work on his Instagram account HERE! For this winning image Brian will receive a pize package filled with illuminating tools from our sponsors below. For your chance to win click here to see the next Light Painting Contest Theme and how to enter. The winner for the June 2017 Light Painting Photography Contest themed “Light Drawing” is… Mario Lechu, a.k.a. 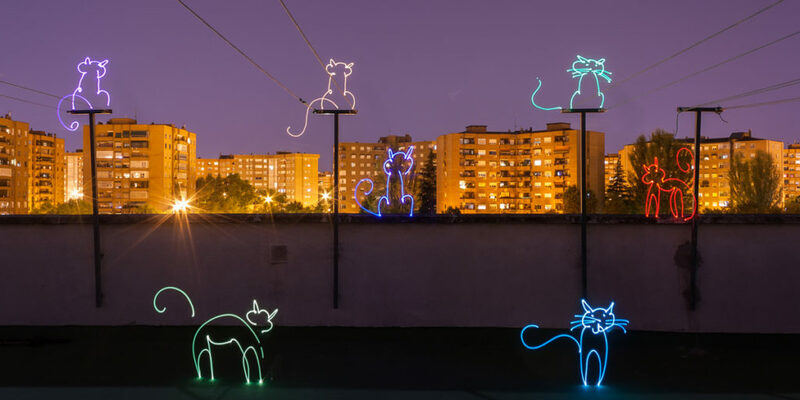 (Le2) for the above image with incredibly placed light drawings entitled CATS. Here is how Mario created his winning image. “One really warm night, in the middle of a heat wave we had some weeks ago in Spain, I decided to go to the rooftop of the building where I live to light paint something. I began to practice how draw them in different positions. I thought about using different colour for each cat too. After practicing for a bit I took some test shots to calculate the proper exposure time. When it was calculated, I pressed the remote shutter to start the shot. The total exposure time for the final image was 6 minutes. After 3 attempts I had the picture I wanted. The shot finished and all cats were where I wanted them to be, the light was good enough and it was not too overexposed. I smiled a lot when I looked at the camera display. I enjoyed drawing them, for me it’s all about having fun when I light paint. The cats also fit very well with the rest of the picture and I loved it at first sight. The tool I used to draw them is the freehand rgb pen from Herramientas Light Painting. It is a really useful tool which allows you to quickly change between colours. It is not too big so you can use it very easily. For this Cattastic light painting creation Mario will receive a prize package filled with treasures from our sponsors below! Please support these companies that support our art form, without them this contest series would not be possible! And the winner for the April 2017 Light Painting Photography Contest themed “Refractograph” is… Tim Gamble for the above titled image “Primordial” Tim shared with us how he created the winning image and he also provided a awesome video tutorial below, Enjoy! Here is a tutorial video I created describing and going through the process. For this fantastical light painting creation Tim will receive a prize package filled with treasures from our sponsors below! Please support these companies that support our art form, without them this contest series would not be possible! And the winner for the February 2017 Light Painting Photography Contest themed “Spirograph” is… Chris Bauer for his incredible image above titled “GATEWAY TO THE IMAGINATION”. Normally I would say for this awesome winning image Chris will receive a prize pack filled with treasures from our sponsors listed below, but this time its a little bit different. Chris has decided to gift his prize package to the Del Mar High School Photography Program to help spread his passion for Light Painting Photography! 🙂 Thank you Chris I am sure the kids will all slap you high-fives for your awesome gesture! Here is how Chris created his winning image! Single exposure light painting made with two lenses. Gear Used: Nikon D7000 with Nikon 32mm & 200mm lenses. Settings: f/8, ISO 100, 405 seconds. First I set up the second half of the exposure using a 200mm lens with a Pringles can attached to it. 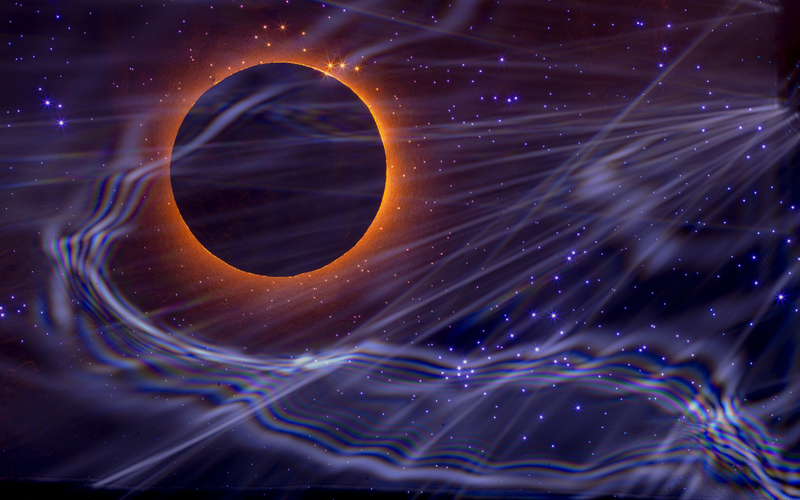 I set a plasma ball on it’s side and centered it in the middle of the tube then focused the shot. Take a couple practice shots so you already know how much you want to expose the plasma ball later. 12 seconds is what I had decided on. Remove the lens carefully not to disturb the focus and remove the camera but leave the tripod. Next I prepare the first part of the exposure using a 32mm lens. Set up a physiogram and aim the camera straight up so the light is in the center of the lens. Next I use a sheet of class and position it above the camera and apply water drops . 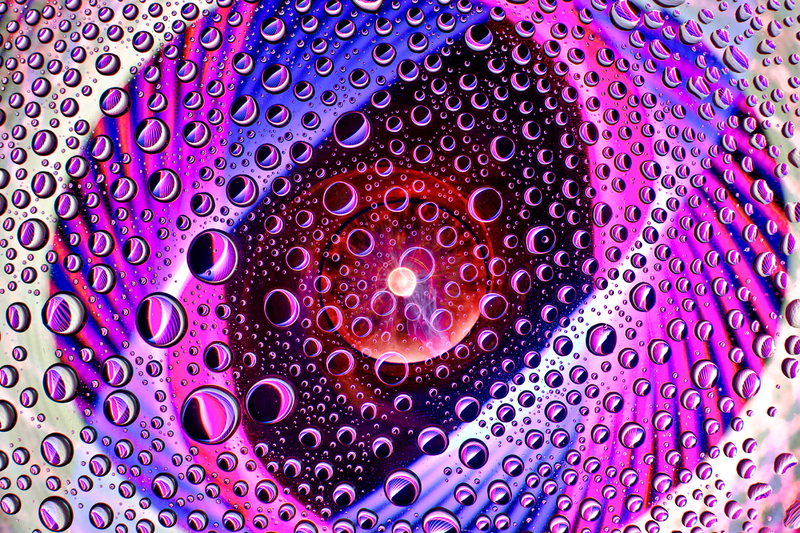 Next focus on the water drops and not the light on the phsyiogram. Now everything is set and in place. Turn out the lights. With a pink light writer and the flashlight blinking, I spin the phsyio in an oval shape until the rotation slows down the cover the lens. Switch to the blue light writer and spin another oval phsyio in the opposite direction and then cover again. Last spin is done with the white light writer in a big circle. When the white light is complete I cover the lens and shut the flashlight off. Remove the 32mm lens while the camera is still shooting and carefully replace it with the 200mm and Pringles can. Attach to the tripod and plug in the plasma, count 12 seconds, then close the shutter.